New: key insights from 339 entrepreneurs and small business leaders. Small and growing businesses are the backbone of our economy. And according to new research by Salesforce, they’re on a quest for growth, with 70% expecting revenue to increase in the next year. What’s behind these business leaders’ optimism, and how are they planning to get there? 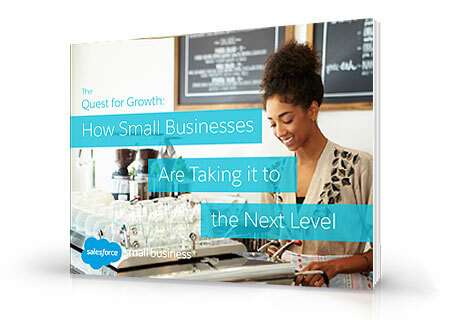 Download our free e-book, The Quest for Growth: How Small Businesses Are Taking It to the Next Level, to find out.